The last time my in-laws visited, we were discussing the quirks of the various family dogs. A certain Irish pooch (we’ll call her Sally) had taken to hopping up on the table to steal my niece and nephew’s breakfast sausages. My father-in-law asked if our Daisy ever took food from the table. We were happy to say she knew the difference between our food and her food. Of course, as we were nattering on about Daisy’s sense of propriety, she was in the other room helping herself to the cheese tray… In general she’s pretty good. With one exception. 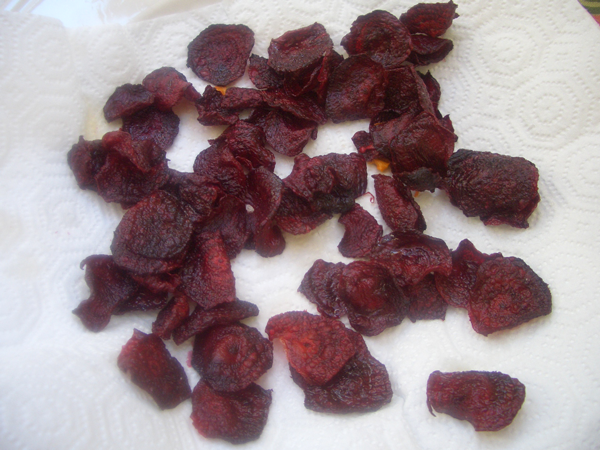 Sweet potato and beet chips. I come from an old San Francisco family. We support the Giants and the Niners whatever comes, and there have been some very lean years indeed. As a stand-up comedian once put it, “There was a time when it was just you and the guy with the beer cans crocheted into his cap freezing your butts off at Candlestick Park.” That was dedication, and we’ve always had it. 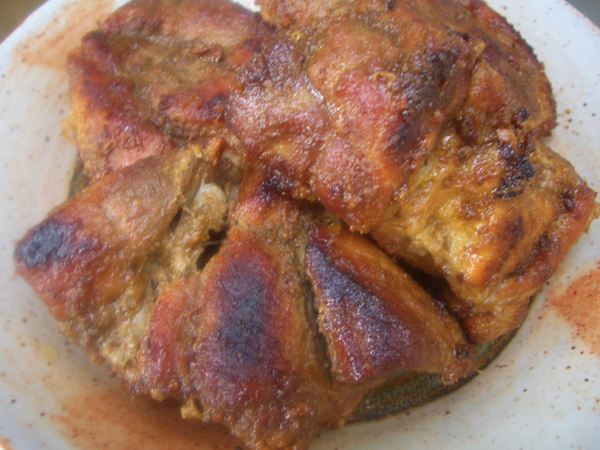 The carnitas recipe is from the Jimtown Store Cookbook. No pictures. Great recipes. I see used copies in bookstores all the time, but you can also order it directly from Jimtown’s website. And if you’re ever fortunate enough to be tootling around the Alexander Valley wine region, it’s worth a visit to the store. 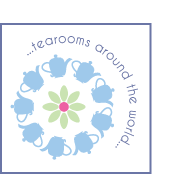 They have a great deli and lots of fun little knickknacks. You can save time by buying any bread you like, or just roll it all up in a tortilla. A note on coleslaw. My favorite is what you get in Ireland. It’s different there. Thicker. Creamier. There’s nothing quite like a ham and coleslaw sandwich on brown bread for a late night post pub snack. The main difference I notice between Irish and American coleslaw–and I’m not sure if I want to know why this is–is the American stuff gets watery. 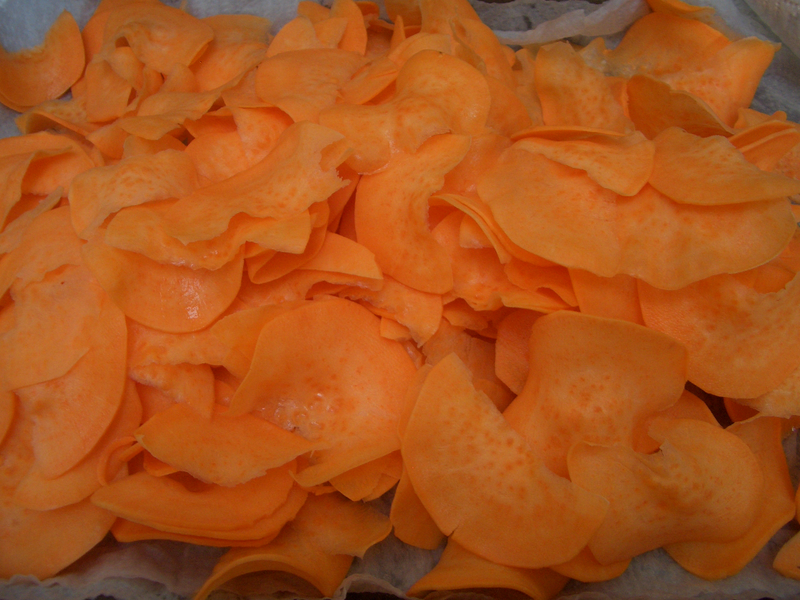 Vegetables when combined with sugar or salt macerate. “Same” ingredients in Ireland but no runoff. Hmmmm… So what’s my point? I don’t have one really. It’s a mystery. And if anyone has the answer I would love to hear it. 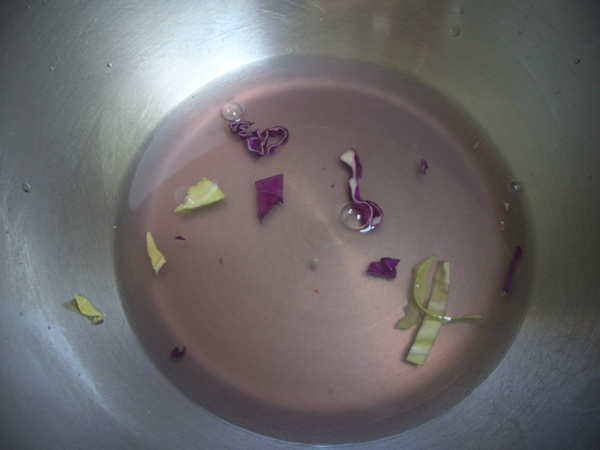 For this slaw recipe we’re tossing the veg in salt and letting it drain for a while to remove some of that water. 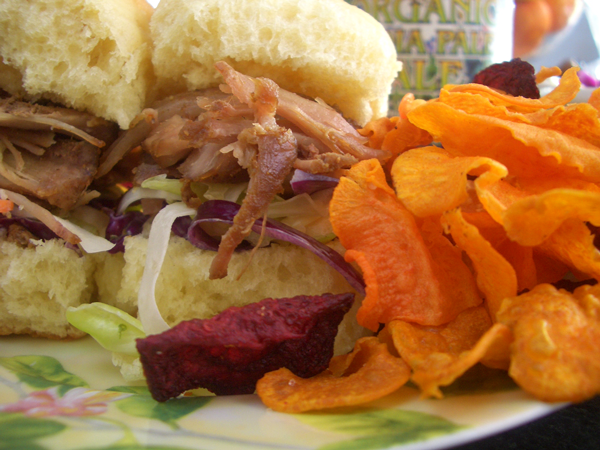 It’s tangy, not too sweet and the hint of lime goes well with the carnitas. 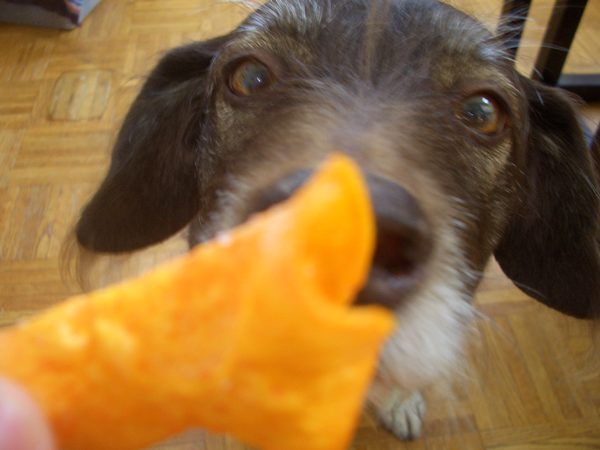 Back to the veggie chips. A few tips. 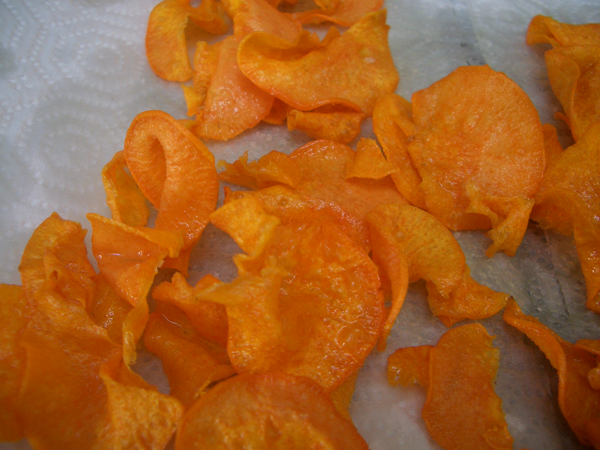 When you fry or bake veggie chips, they tend to go from being almost done to overdone quickly. I recommend taking a little extra time and making small batches. You’re going to get at least one batch wrong, so why ruin half your chips? They also tend to cook better in small batches. I did try a healthier baked version of the chips, and I’d be lying if I said they were just as good… Even though we’re frying, I’m always up for trying to find a way around using quarts of oil. Shallow frying the chips in a few inches of oil in a smaller pot worked great. You will have to make more batches, but they only take two to three minutes per so… The big thing I want to point out about the chips is you need to dry them out a bit in the oven to make sure they stay crisp. All the chips I made, baked or fried, were crispy at first, and then a few hours later they were a little squidgy. The next day they were soggy. 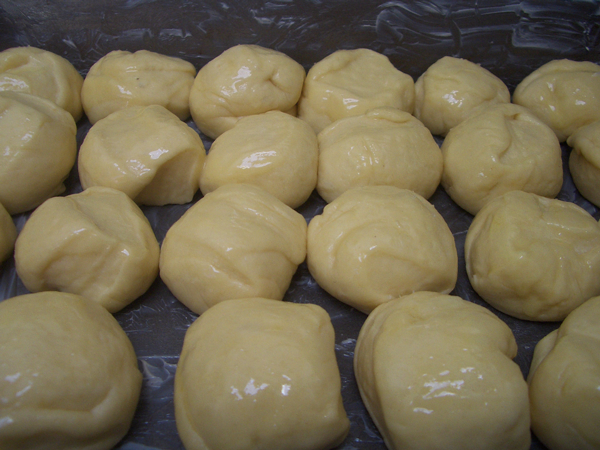 By drying them in the oven, they can be stored in airtight containers for several days, maybe longer–I wouldn’t know as they don’t last that long. Everything can be made the day before. 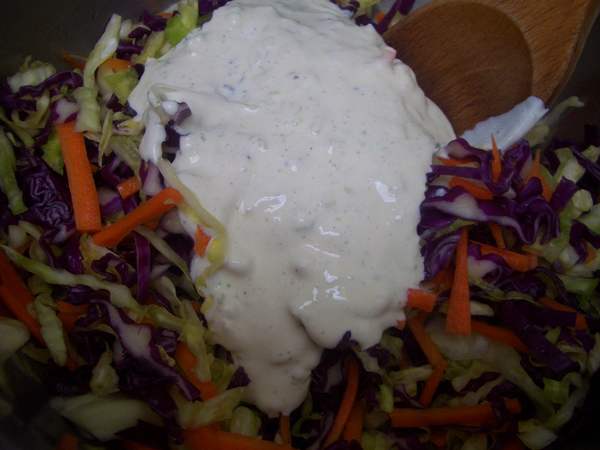 In fact, it’s best to make the coleslaw at least a few hours in advance to give the flavors time to meld. Drinks: Who are we kidding? Beer. If you want something soft, iced tea. This is the full recipe. I usually split it in half. So if you’re looking at the photos and thinking “That’s not five pounds of meat!” that’s why. 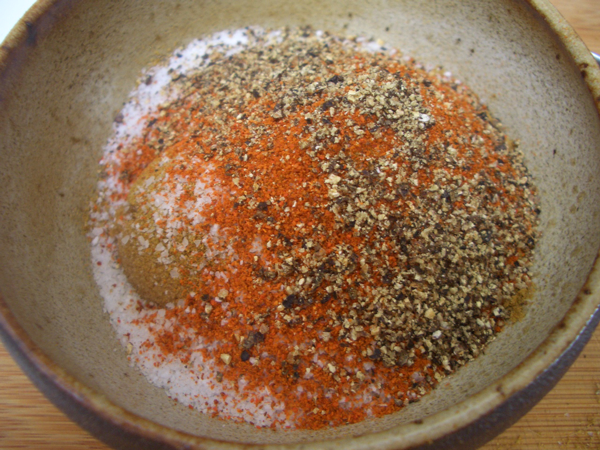 To make the rub, in a small bowl, mix together the brown sugar, cumin, salt, cayenne, and black pepper. Rub it all over the pork. 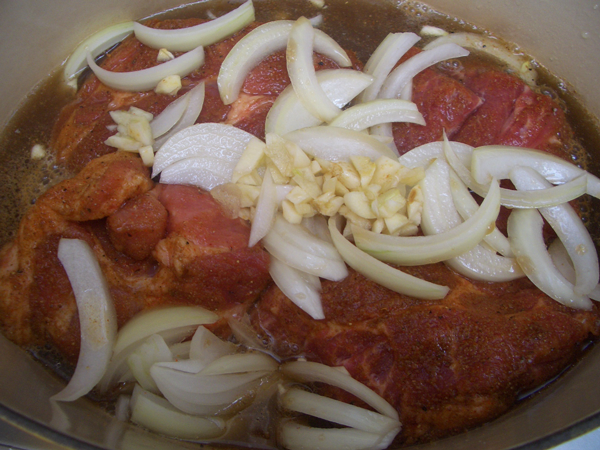 Transfer the pork to a sturdy non-reactive Dutch oven or stock pot. Scatter the onion and garlic over the pork. Add the chicken stock and cola. Bring to a boil, uncovered. 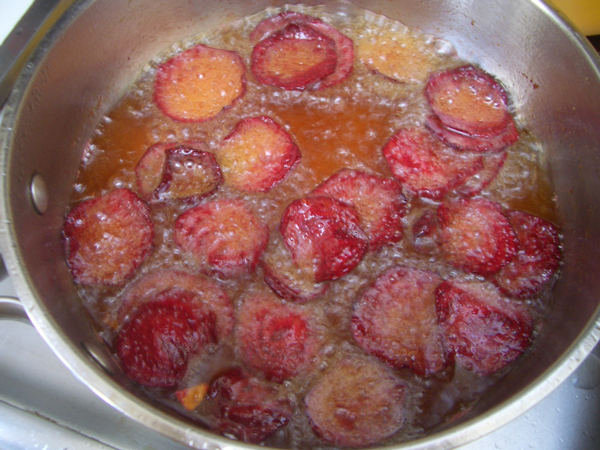 Lower the heat to a simmer and cook for 30 minutes. 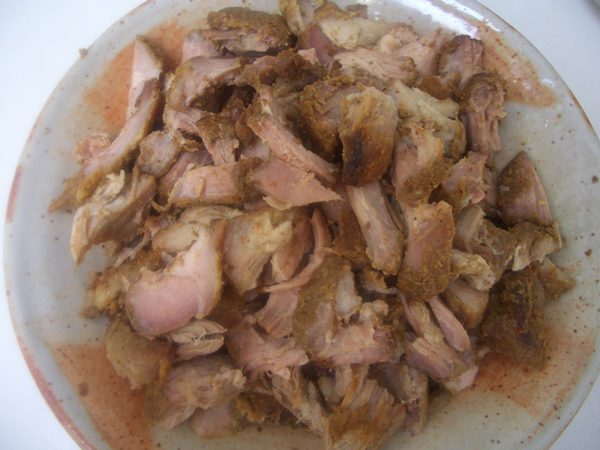 Uncover the pot, flip the meat and continue to cook–rotating the meat occasionally–until the liquid has evaporated and the pork is tender, about 1-1/2 to 2 hours. At this point the stock and the cola will be gone but there will be a good amount of rendered fat at the bottom of the pan. You want to continue to cook the meat in the fat until it is nice and brown, about another 10 minutes. 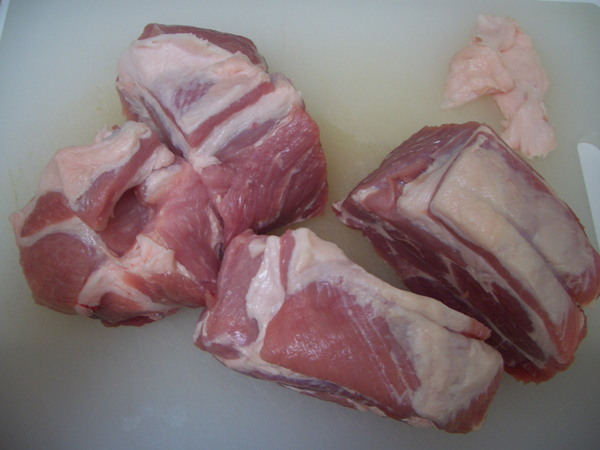 Remove the cooked pork from the pot and allow to cool to room temperature. You can either refrigerate the meat overnight or shred and serve. If serving the next day be sure to warm the meat before serving. If you use all the vegetables and fruit you will wind up with about two quarts of slaw which should be enough for all the sliders and a little something on the side. *Don’t cut up the apple until you have the dressing made, so you can toss it with the dressing to keep it from discoloring. I’m not trying to make things difficult. 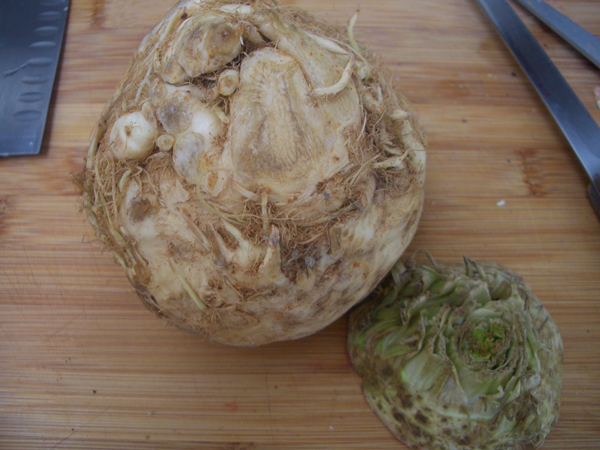 I know celeriac isn’t a common item, but it’s common enough that I’ll put it out there. 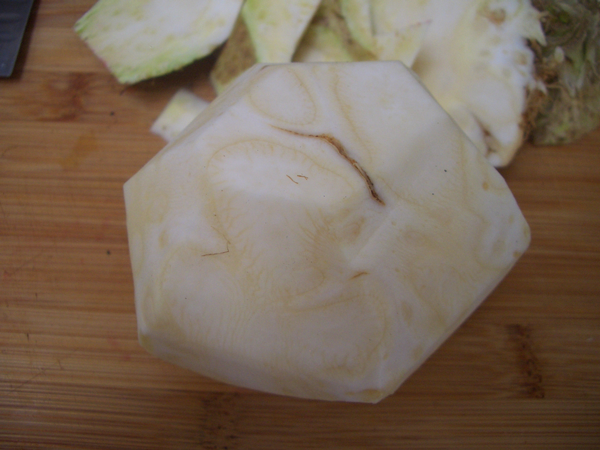 And though it looks a bit daunting–like a character from The Hobbit–it is very easy to peel and cut. 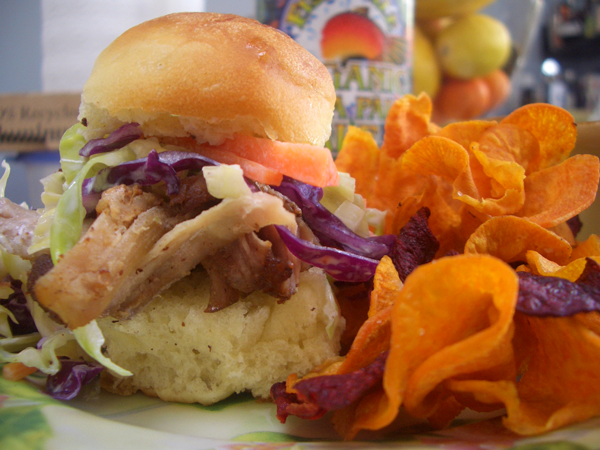 It has an interesting flavor, similar to celery, that worked really well in the slaw. Same for the apple. Most coleslaw recipes call for sugar and are a bit too sweet for me. Adding a little apple added one more kind of crunch and just a hint of sweetness. If you don’t use apple, you might want to sprinkle a little sugar into the slaw. But taste it first, you might like it the way it is. To make the dressing, combine the sour cream, buttermilk, onion, vinegar and lime zest. Cut the apple and toss with the dressing. Set aside. 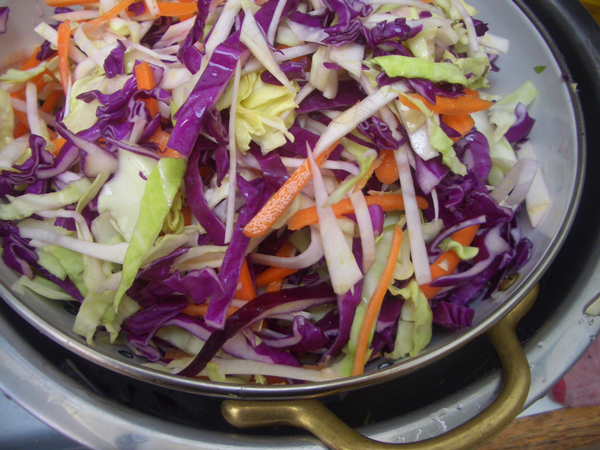 In a large bowl, toss the cabbage, carrots and celeriac (if you are using it) with the salt. Transfer to a colander and put the colander over the bowl to drain. Let stand for one hour. Rinse with cold water and pat dry with paper or cloth towels. 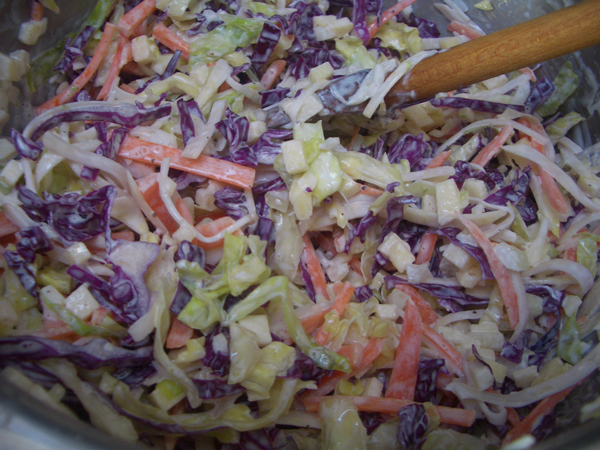 In a large bowl, combine the cabbage mixture, apple and dressing. Mix well. Adjust seasoning with salt and pepper. It might not need either. Remember the flavors will continue to develop as it sits. One large sweet potato yielded about four cups (960ml) of fried chips. Three medium beets about one cup (240ml). Keep the sweet potatoes and beets separate. 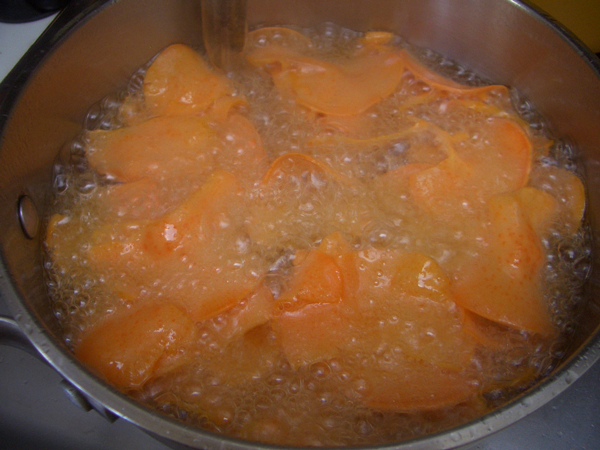 Two bowls for soaking, and fry the sweet potatoes first, otherwise everything will be pink. Peel the vegetables. 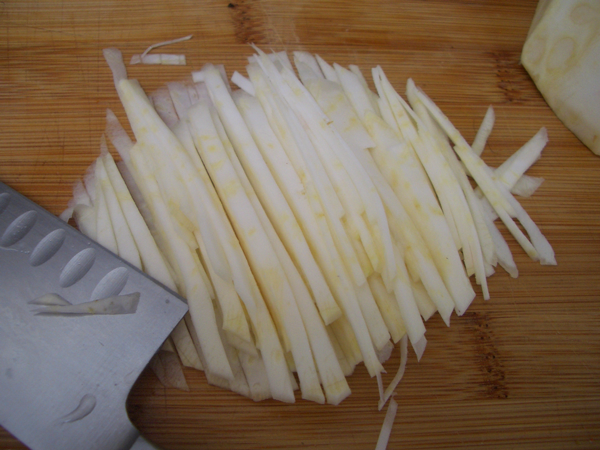 Using a sharp knife, mandoline or Japanese slicer, slice the vegetables very thin. Please be careful. Madolines and slicers are very sharp and I’ve often been too impatient to use the finger guard. We won’t talk about it, but I don’t recommend it. 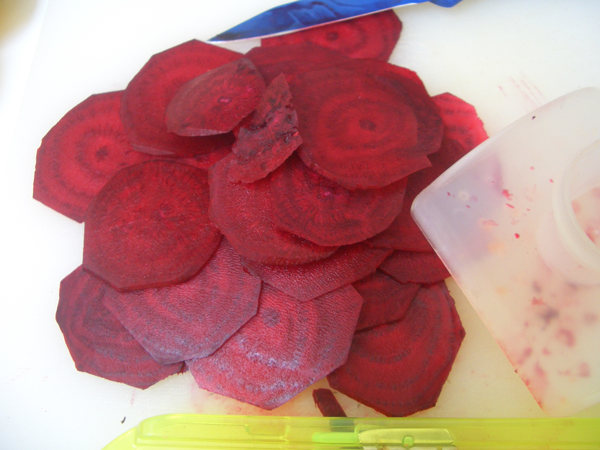 If you’re not making the chips right away, put them in water to keep them from discoloring–again, one bowl for the sweets another for the beets. When ready to fry the chips, pat them dry with a paper towel. Be thorough, otherwise when the water hits the oil it will splatter. Heat two inches of oil in a small pot with a heavy bottom over medium high/high heat. If you have a candy thermometer use it to check the temperature. The oil is ready when it reaches 350 F degrees (175 C). If you don’t have a thermometer add a chip to the oil. It should start to bubble immediately. 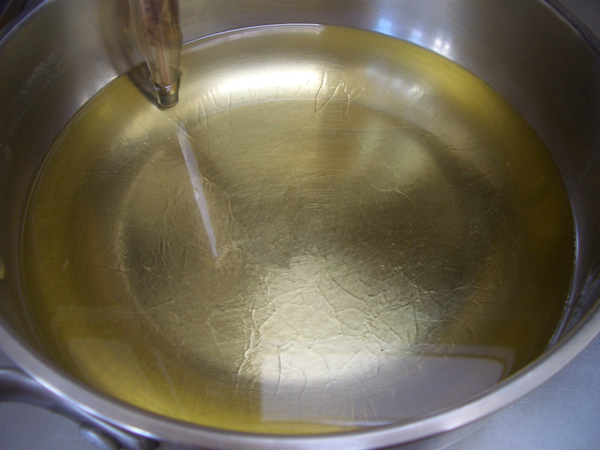 Add the chips to hot oil in small batches. Cook for 2-3 minutes. When they’re ready, the bubbling will have for the most part subsided. You should be able to see them clearly, and they will look a little crisp around the edges. They might not be totally firm. 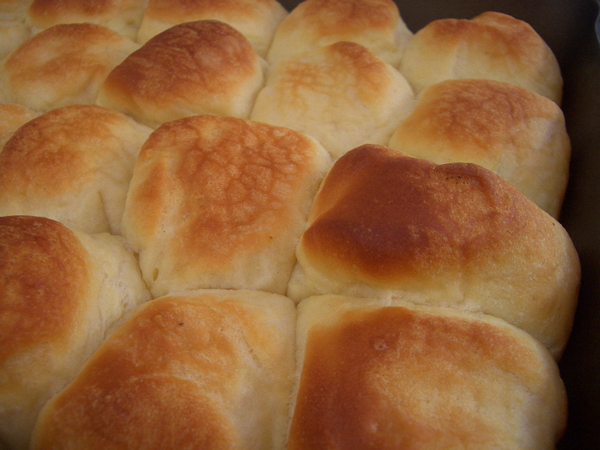 Remove them with a slotted spoon and transfer to a paper towel. The sweet potatoes will still have a bright orange color, the beets a deep red. If you’ve cooked them for too long, both will look a dull brown. While still warm, sprinkle the chips with sea salt. Once you’re through cooking the chips, preheat the oven to 350 F degrees (175 C). Let it get good and hot and then turn it off. Transfer the chips to a baking sheet and put in the hot oven. Let them sit in there until it cools down. This will remove any excess moisture so your chips will stay crispy. Once the chips are cool, they can be stored in an airtight container for several days.